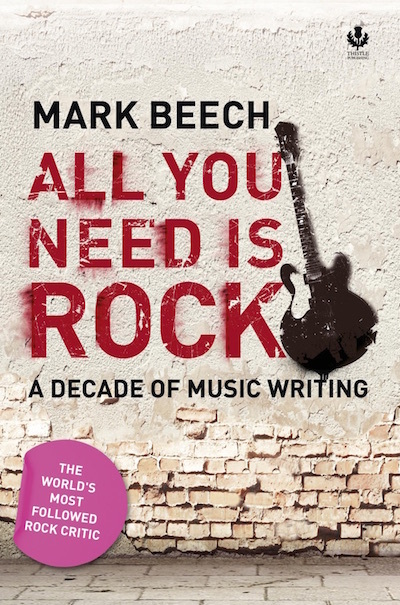 This is the fourth book by Beech, for 10 years the rock critic for Bloomberg News, with columns syndicated to 500 newspapers worldwide. All You Need is Rock contains writing about stars such as John Lennon, Lady Gaga, Kanye West, Amy Winehouse, Madonna and Michael Jackson. File under music, journalism, culture/lifestyle. The interviews include Sting, Steve Miller, Brian Eno, Adam Ant, Steve Van Zandt, Mary Wilson and Kevin Rowland. Stars getting the most attention include the Beatles, Elvis Presley, U2, Lady Gaga, Madonna, Nirvana, Led Zeppelin and the Arctic Monkeys. Mark Beech recounts how he rubbed shoulders with Amy Winehouse and Kanye West backstage and at secret gigs. There’s a constant reassessing of reputations as stars’ personal lives and music collide. The passing of Winehouse, Michael Jackson and more lead to candid commentaries on what their legacy will be, spiced up with inside knowledge and humor. Now, thousands of records and reviews later, I’m still looking for records that give me the same excitement. It’s rare, but boy is it great when I find one. The former Beatles were once asked, some years after the single and in retrospect, was love all you need? The replies were in character. George, the religious hippy that he was said "yes, definitely." Paul, showing that spirit of middle-of-the-road compromise, said maybe. John said no -- you need money, intelligence and a lot more. Ringo said he hadn't got a clue.